When you connect, you first get a wide view of your baby's room. The video feed's high definition lets you zoom in up to 4 times to have a close look at your little one. You can then pan and tilt to have a look around. It's almost as if you were in the room, checking in on your child. This monitor is on watch day in day out. The infrared Night Vision LEDs automatically light up when needed, to bring out a clear image even when it is pitch black. The monitor's high quality audio feed is great to be alerted if baby cries, but it's also clear enough to hear him calmly breathe. Not to mention jumping into a conversation he's having with his toys. 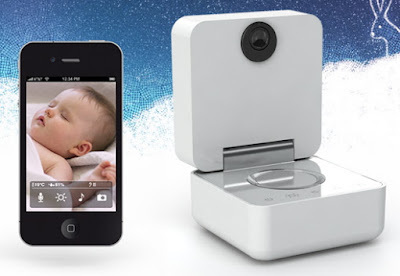 Beyond traditional baby phone options the Smart Baby Monitor offers advanced features. Prepare for a soothing "Sound & Light" interactive experience. Not only can you hear your baby, you get to talk to him. Just hold the "Push to talk" button on your smartphone/tablet and speak into the microphone. Turn on a comforting light to reassure your baby or to discreetly check on him while he sleeps. The app even lets you pick a particular color or launch a rainbow animation. Built-in sensors tell you if the room's temperature and humidity are within the recommended levels, for the healthiest sleeping conditions. Put the alert in perspective. Access a recorded history of the sound and movement variations over the past 15 minutes from within the app.